How Green-Y works: Compressing air creates heat and consumes electricity. Expanding air creates cold and generates electricity. These two main steps are performed separately in time. 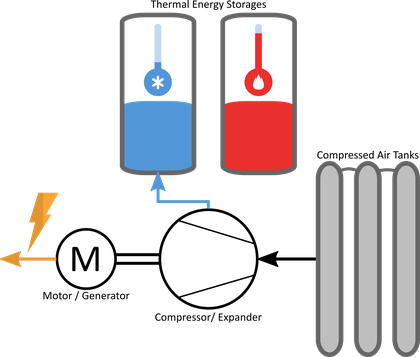 Therefore, Green-Y unifies the functionalities of a heat pump and a battery. Our unique technology yields a game changing high energy density which makes a decentralized application possible. As a result, Green-Y can be installed locally where electricity, heat and cold are needed. Transportation losses and the need of costly infrastrucutre are minimized. 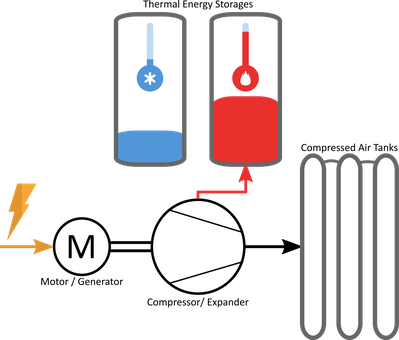 The heat energy can be used to provide e.g. hot water for domestic use and the cold for cooling down e.g. the building. The compressed air is stored in commercial pressure tanks which is a durable and inexpensive solution to store electricity.